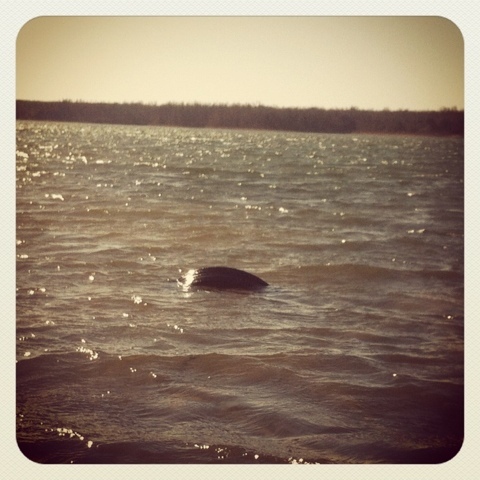 We caught the first photographic evidence of the Fellows Lake Monster. 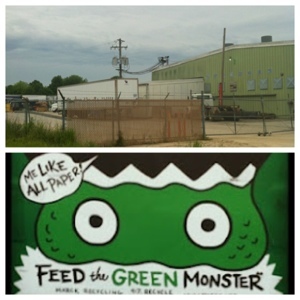 We found the lair of the infamous Green Monster in Republic Missouri. 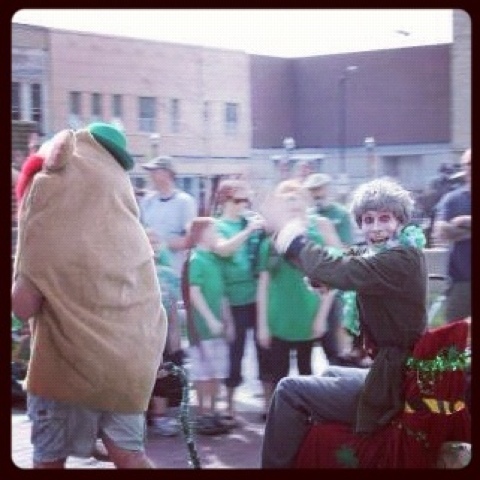 We discovered all sorts of pictorial evidence of creatures on the streets of Springfield Missouri. We had a Close Encounter of the Third Kind near St. Louis Missouri. Multiple pieces of evidence of an ancient frog cult were uncovered in Springfield and St Louis Missouri and at the Cahokia Mounds in Illinois. 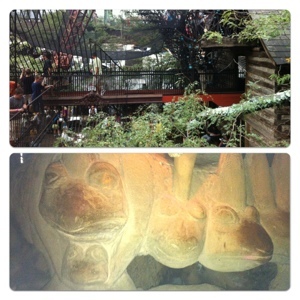 Our exploration of the center city Lost World of Jordan Creek began. In spite of overwhelming odds, we were able to help treat a Zombie Outbreak at the Monster Dash. 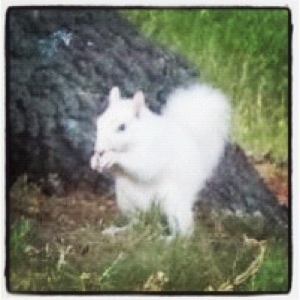 The Mutant White Squirrels of Marionville Missouri were shown to exhibit psychic powers. 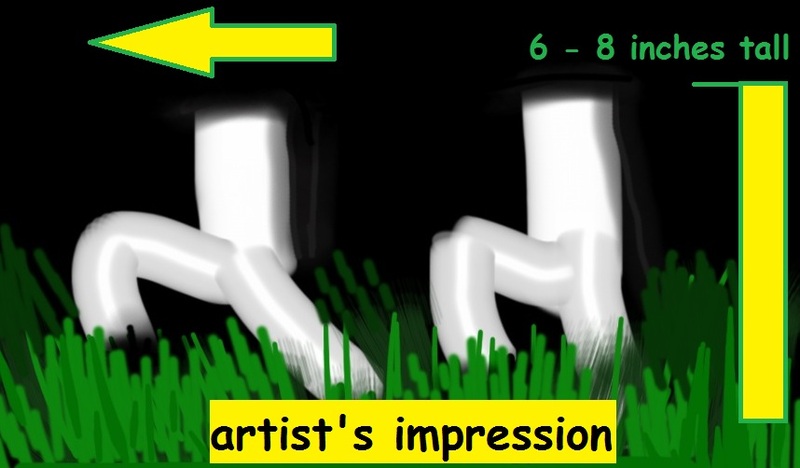 We have postulated the existence of a species of animate cryptid fungi. 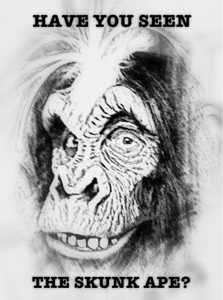 And, of course, we continue to track down the Elusive Urban Skunk Ape! 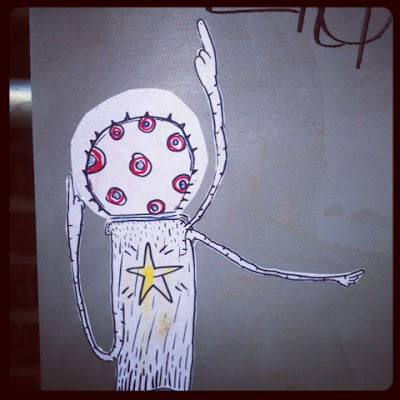 And so, in 2013, we invite you to continue to follow our explorations into the strange world of Urban Cryptids. 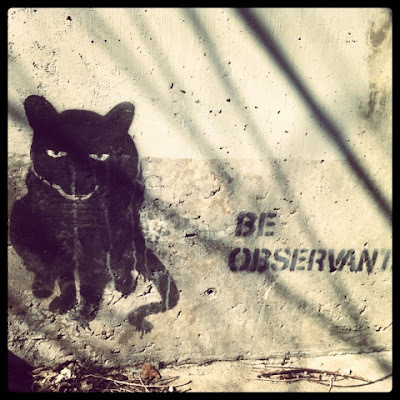 Check back next week to see what the Urban Cryptid Conservancy will be researching next! It's not surprising that cryptids go unseen by most people. On the other hand, what is surprising is that we can go about our lives and never really notice the poor and needy all around us. In fact, we often treat them as if they were invisible. and give them your support. As we continue to examine the historical evidence of Cryptids and Cryptid Hunters in the area around Springfield Missouri we find further hints regarding the Fraternal Order of the Seekers of the Skunk Ape. According to legend, members would, at unexpected times, leave their homes in the dark of night to "join the hunt, for the game's afoot!" and, at times, not return for days. Before the turn of the century, it was rumored that the organization maintained a collection of oddities of Natural History in its secretive Fraternal Lodge near the mineral spring at the town of Bethesda, just northwest of Springfield. 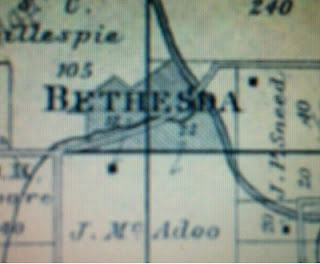 Eager to find what became of this collection, we found the location of Bethesda on a turn-of-the-century map and proceeded to the site. Imagine our amazement when we discovered that the entire town had vanished! No, I do not mean "vanished" in the manner of a ghost town where a few ramshackle buildings remain - I mean truly vanished. As we searched the area we found that NOTHING remains, as nature has completely reclaimed the grounds where once was a town. Indeed, the town of Bethesda disappears from later area maps, as if the powers-that-be decided to erase all mention or trace of it. We cannot help but wonder what could have caused an entire town to be removed from history, or what happened to the Fraternal Lodge of the Seekers and its strange collection. It is not until the 1950's that any more mention appears of the Skunk Ape or any other cryptid in the Springfield Missouri area. The puzzling case of the Springfield Cobra Scare of 1953 appears to have brought strange creatures back to the city's collective consciousness and the nation's preoccupation with monsters, both earthly and otherwise, in the later 50's and 60's appears to have reminded some Springfieldians of their own cryptid legends just as the city came into the national spotlight through the Ozark Jubilee television and radio program originating out of Springfield's KYTV and KWTO radio. Nationally revered folk musician Jimmy Driftwood first learned of Springfield's Elusive Skunk Ape while performing on the program, and although he probably never saw the creature, it was the the inspiration for his song, "The Lonesome Ape". Today, the citizens of Springfield are becoming increasingly aware of the presence of strange creatures in their midst. Though little concrete evidence remains to prove that the Fraternal Order of the Seekers of the Skunk Ape ever existed, we of the Urban Cryptid Conservancy see them as pioneers in our field and the progenitors of our efforts. Along with with its legends of cryptid activity, Springfield Missouri has a long history of being the home of cryptid hunters. Though much of this history exists only as folklore, our research has uncovered documented accounts of these intrepid individuals. It is said that he was continuously wandering the area, looking for some beast unseen by civilized men. We can only guess what that was, or if he ever found it. Later, as Springfield grew and prospered, some of its most respected citizens took part in the search for strange creatures. According to the September 1st, 1907 edition of the Springfield Leader, former Springfield mayor B.E. Meyer, along with Lee Savage and Frank Rosback were searching for a monster "man eating" catfish said to live in Doling Park Lake when their canoe was capsized by the very animal they were seeking. It should be noted that Mr. Meyer was listed in the rolls of a number of local secretive societies such as the Royal Arcanum and the Knights of Pythias, and was three times elected as the Exalted Ruler of the local lodge of the Benevolent and Protective Order of Elks, while Mr. Rosback was a successful clothier and loyal Freemason. This should not be surprising, as it appears that they were members of an even more secretive fellowship, the Fraternal Order of the Seekers of the Skunk Ape, an organization rumored to have been founded on All Hallows Eve of 1872. One night earlier this week I was following a lead on a potential Skunk Ape sighting on West Bypass when I literally stumbled upon a remarkable little place on the edges of the City. 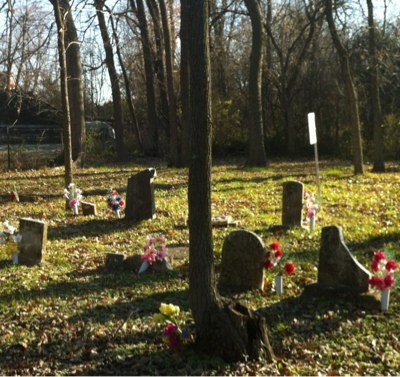 This tiny lost plot of land is the Rose Cemetery, which, it turns out, is the final resting place of Kindred Rose, one of Springfield's earliest residents. Kindred Rose was not only the man credited with giving Springfield its name - According to legal records he also was a successful property and slave owner, and in 1867 became the man who smacked a Mr. James Simpson in the head with an iron bar (the Union and Emancipation were still touchy subjects). On the night I first accidently discovered this place I attempted to photograph it, but the picture was ruined by the presence of a lot of pesky orbs. I returned to the place two days later to take the photograph shown here. While researching the history of this spot, I came across a number of bits of information that hint at the earliest attempts to find the Elusive Skunk Ape in Springfield. More on this in next week's post! If you have not already read the previous entries regarding the tiny unidentified cryptids and the previous rational explanation thereof then do so before continuing. From here on things get a lot more strange. 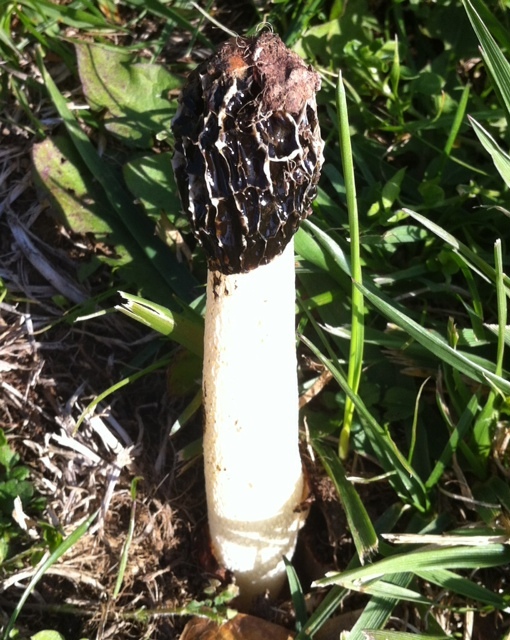 In the years since I saw the tiny running creatures I had settled on the kitten hypothesis mentioned earlier, but that all changed a month ago when I spotted this rather tall mushroom, one of a number of species commonly called False Morels, growing in a neighborhood lawn. I instantly recognized the cylindrical shape and color of the stalk as being identical to that of the creatures, leading me to my new theory: The Animate Fungus theory! As you'll probably remember from Biology Class, a mushroom is only a small part of the fungal organism - the "fruiting body" of the underground mycelium which grows under the soil as a network of hyphae, often over a rather large area. The purpose of the mushroom is to spread spores to new areas. Unfortunately, the urban environment can limit the growth of mushrooms. Any portion of the mycelium growing under concrete or asphalt is unable to sprout a fruiting body above itself, and wide areas of man made surfaces keep spores from ever finding fertile ground. On the other hand, some distant relatives of mushroom sprouting fungi have motile phases. Members of the Chytrid phylum create spores with flagella that can swim through water. Land dwelling Slime Molds (which are not true fungi) go through an amoeboid motile phase that allows large patches of the organism to slowly crawl across a surface as a single unit - a thought that once terrified me as a boy! Even the cell structure of fungi resembles simple animals more than plants, with cell walls made not of cellulose like plants, but of chitin as found in the exoskeletons of arthropods. So, when I first saw the aforementioned False Morel, I suddenly realized that a mushroom having the ability to separate itself from the mycelium and sprint short distances across roads or parking lots would have a definite advantage over other mushroom species in an urban environment. The tiny white creatures I had seen were the stalks and legs of two sprinting mushrooms, their black caps invisible in the darkness. Since then we have been able to collect and dissect a number of similar mushrooms in hopes of finding one with evidence of limb development, but so far we have been unsuccessful. Perhaps the motile species, otherwise similar to other Morels and False Morels, only develops limbs immediately before sprinting? Obviously we have a lot more searching ahead of us. Last week I described the two tiny creatures that I saw some years ago in a darkened front yard here in Springfield Missouri. Over the years I have come to two conclusions as to what kind of creature or creatures I saw that night. This weekend I will describe what I call the Rational Explanation, while next weekend I will cover my New Explanation. If you'll remember, I caught sight of two little, white, headless and armless creatures running through the grass in a darkened lawn just south of the Brentwood Library. Every cryptozoologist should always be aware of the possibility that the strange creature being observed may just be a common animal that looks strange because of the peculiar circumstances of the situation. Thus I came to the conclusion that the two little cryptids were actually one animal. 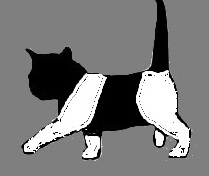 As you can see in the illustration, a kitten with a black head, torso, and tail and white haunches and legs could appear to be two smaller running animals. Mystery solved! Usually, an observed phenomenon can be quickly classified - common animal, cryptid, or whatever. Sometimes, though, one sees something that is very difficult to identify or explain. The following is something I experienced some time ago that I only now have been able to explain to my satisfaction. Indeed, I now realize that I may have seen an entirely new classification of cryptid lifeform! About twelve years ago I was driving through the Brentwood neighborhood in southeast Springfield, just south of the Brentwood Library on Stewart Avenue. One section of the street was not well lit by the streetlight, yet two white objects in the darkened yard to my right caught my eye. Suddenly, as my headlights briefly flashed across the yard, I caught a clearer view of two small white creatures running through the lawn. Each one was less than eight inches tall, with two legs and no visible head or arms. Then, just as suddenly, I lost sight of them. For years I have rationalised this strange experience as a mistaken sighting of some mundane sort of creatures. Indeed, they did not appear to be any kind of imaginable animals, normal or cryptid. Yet, this week I made an observation that gave me an amazing new possible explanation for these tiny unidentified creatures. 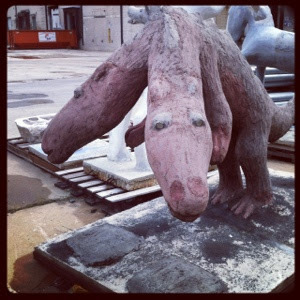 Big Changes at Urban Cryptids! Second, the updated Urban Cryptid Rangers Unite tab - more information on becoming an Urban Cryptid Ranger is on its way, but in the meantime you can go to the Online Equipment Source. Third, the ZOM ALERT tab - There's been a lot of zombie and other "aberrant human" activity recently which needs to be filed separately from cryptid reports. 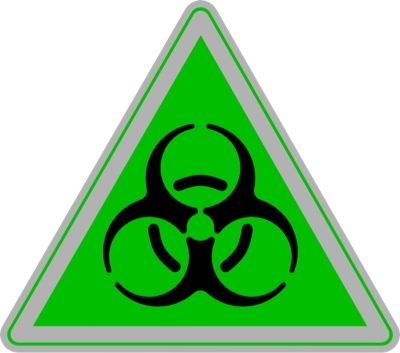 Click the ZOM ALERT tab to find the link to the website of the SW MO Zombie Response Team. Having already described the mutant psychic white squirrels of Marionville, I have been watching for any evidence of their intrusion into other communities. While on patrol yesterday I spotted a crowd of white animals in a southwest Springfield back yard. 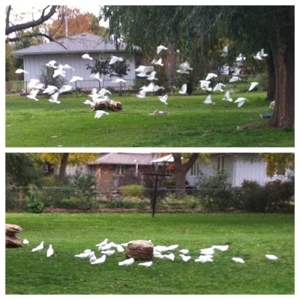 Upon closer investigation, they proved to be birds, not squirrels - a large flock of identical snow white pigeons! They quickly realized they were being photographed, and flew in unison to the roof of a nearby outbuilding. I decided to investigate further, so I rang the doorbell of the owner of the property. It turns out that the gentleman who owned the property had bred and raised this flock of identical white pigeons, but for what purpose he did not say. He did state that they are quite obedient and return to their coop every evening. Relieved, I went on my way, trusting that he will continue to maintain control of his strange flock and use them for good, and not evil, purposes! 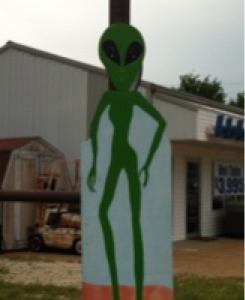 This week's picture comes to us courtesy of an anonymous photographer in the Lake of the Ozarks area who shot this image of what they claim to be an alien standing in the parking lot of a flea market. Now, regular readers of this blog will be well aware of the fact that I am a naturally skeptical individual, and I have doubts about the authenticity of this picture. To my trained eye, this actually appears to be some kind of painted cut-out secured to a pole. I believe that this is just another example of how misleading material from the Internet can be. Rest assured that I will always endeavor to bring you evidence that is verified to be at least 90% true! The Zombie Outbreak is Nigh! As mentioned earlier, I have been recruited by the area's Zombie Outbreak Response Team and have been given an important and expendable position in the group! Though I have not yet actually SEEN a brain eating mutant yet, I have determined that they are a mutated form of human being and are not classified as cryptid animals. I have also been told that zombification is a treatable condition (something not seen in the movies). 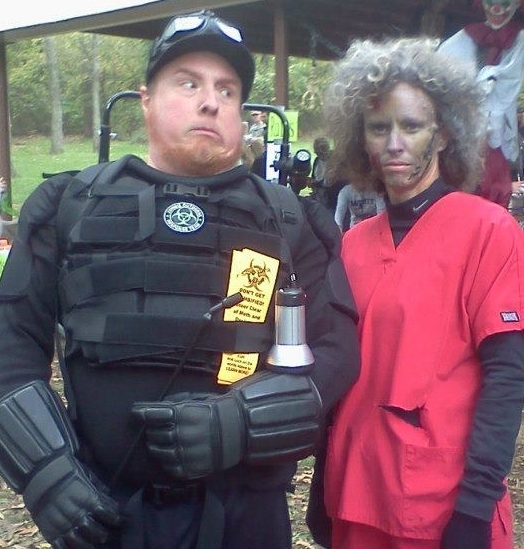 We are now preparing for the expected zombie outbreak at the Monster Dash at Ritter Springs Park at 1 pm on Oct. 6. Don't miss out on the fun! We're sorry that the blog was inaccessible for a couple of weeks - an attempt to set up a new domain name (urbancryptids.com) got rather messed up by some googliness at Google, but the site is back on line under its original URL. Stay tuned for the relaunch of the new domain, and in the meantime check out the article below about the ancient frogs of Cahokia! For the final piece of the puzzle to the ancient frog mystery we made our way to the Cahokia Mounds Museum and Historic Site just east of St. Louis near Collinsville Illinois. The Moundbuilders of Cahokia were part of the Mississippian culture that flourished in what is now the central United States from around 600 to 1400 A.D. They left behind many remarkable artifacts, including the great mound city at Cahokia for which they are named. This pipe bowl of fire clay depicts a frog-like creature holding a ceremonial rattle in its hand. This is one of three such ceremonial frogs that have been found related to the Moundbuilder culture. 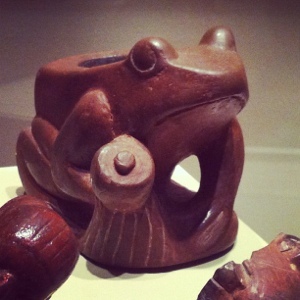 So, did these frogs have some importance to the dwellers of Cahokia? Do they represent magical animals, or some kind of intelligent cryptid like the infamous "Loveland Frogs" of Ohio? Do they have any link to the more recent strange frog images that we have previously discovered? Perhaps we will never know! Armed with our special equipment packs we arrived in St. Louis Missouri well prepared to explore the insanely baroque majesty of the City Museum. Created by artist Bob Cassilly and his small army of artisans, the Museum is built largely out of the detritus of the city itself. As we climbed and crawled through the many passageways of the building we found signs of innumerable creatures and caught sight of many living creatures as well. But it was in the darkest depths of its maze-like caverns that I made my most stunning discovery. While crawling blindly through the cramped and narrow catacombs my hands fell upon strange yet familiar stone shapes. Covering the walls of this passage were the grim stone visages of giant frogs, very much like the giant stone frog statue that we had found south of Lake Springfield! Was this just a coincidence, or was this evidence of some kind of ancient cryptid amphibian activity? 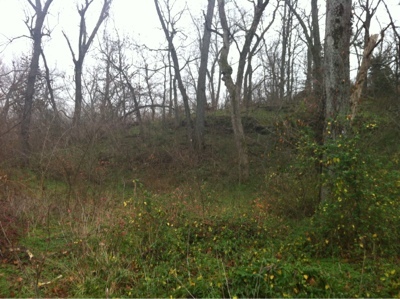 The very next day we made another discovery outside of St. Louis that proved how truly ancient it was! 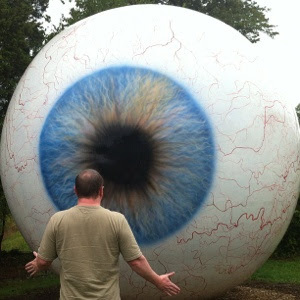 While traveling to St. Louis to investigate reports of cryptids in and around the City Museum we discovered this strange alien creature in a park southwest of the city. Though it appeared frightening we discovered that it was peaceful and entirely harmless. Unfortunately, we were unable to communicate with the alien. 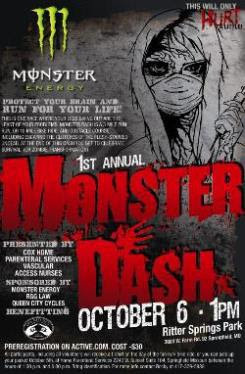 Well folks, I was going to just report on the MONSTER DASH Zombie Run at Ritter Springs Park on Oct. 6th, but now it looks like I'll be running in the event! Last Tuesday I received a phone call from a local doctor who is gathering a few science professionals and students to form a small Zombie Response Team. Even though I am not fully convinced of the existence of zombies, I have joined them to start training for the race and in unarmed zombie response skills. I'll let you know when I find out more about the truth behind all this zombie craziness. 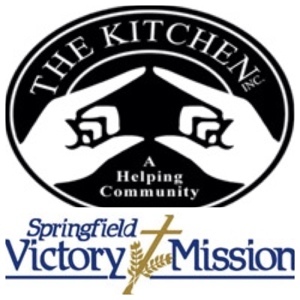 Whatever happens, this should be a great fundraiser for The Kitchen. 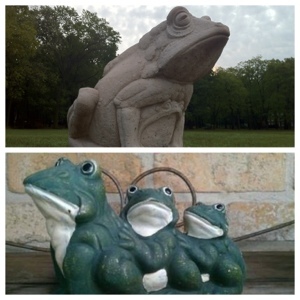 Since last week's post we have been inundated with messages from folks concerned with the possibility that frog sculptures in neighborhood gardens might represent some kind of frog-related cryptic activity. We are happy to report that most of these frog statues are perfectly normal garden decorations and are no cause for alarm. Unlike the huge, spooky stone frog described before, these garden statues simply depict frogs in whimsical fashion. 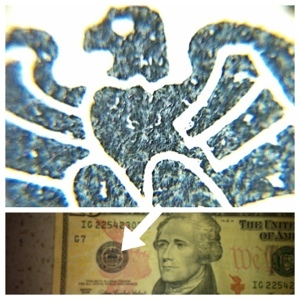 For example, the photo at the bottom does not show a multi-headed, multi-limbed mutant frog as one reader feared. Rather, this statue depicts three frogs engaging in what amphibian scientists refer to as a "frog conga line dance". This rare behavior is only exhibited by frogs when they hear a strong syncopation before the fourth beat of the measure. There are times when the search for strange and unusual creatures leads one to discoveries beyond the scope of Cryptozoology and into the realm of the truly strange. Just such an event occurred this week as we were driving into Springfield Missouri. Just before crossing Lake Springfield, we caught sight of what appeared to be a giant frog sitting in an empty expanse near the U.S. 65 44 mile marker. 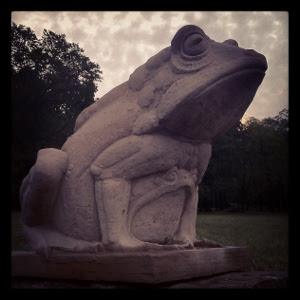 After parking the car and making a short jog across the marshy ground I came upon the object - a hauntingly strange idol-like stone statue of a frog well over 4 feet tall! Who created it, and why was it put there? Is it a religious icon of some strange ancient cult? Could it be related to intelligent inhuman creatures such as the infamous Loveland Frogs? 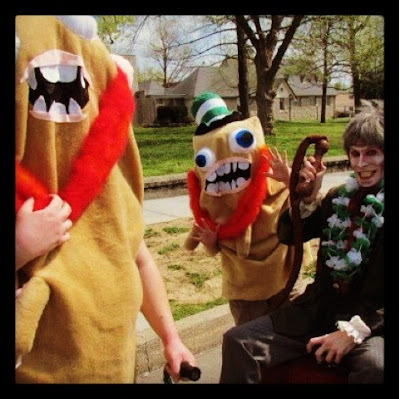 Perhaps this is a case for the Ghostbusters of the Ozarks or macabre maven Uncle Gregory! When I was a young boy I first heard the tale of the giant catfish that lived on the upstream side of Kissick Dam at James River Power Station at Lake Springfield. According to the story, a diver performing an inspection had seen a catfish the size of a Volkswagen Beetle lurking at the base of the dam. Later, as an adult, I heard many other stories of giant catfish at other dams around the nation. Those tales told of Buick sized catfish and truck sized catfish. In fact, it seems that every dam in the country had its own giant catfish legend. So why is our giant catfish smaller than everyone else's giant catfish? The fact is, the dam at James River Power Station is actually rather small. Unlike larger dams that are used to generate hydroelectric power, our dam simply collects water to be used to generate steam in our coal-fired power plant. It makes sense that a smaller dam would be home to a smaller giant catfish. Still, it must be a very cozy home for our monster fish. Water heated by the power plant is reissued into the lake close to the dam, making it nice and toasty warm during the winter. 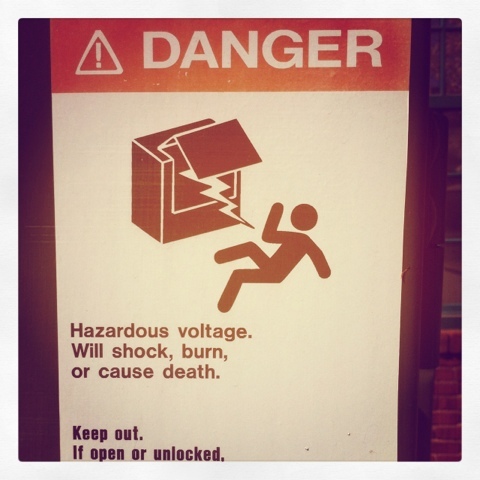 Please note the warning in the second picture. 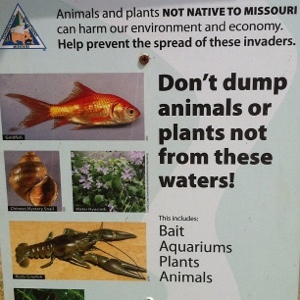 Do not release any non-native creatures into Lake Springfield. We would not want them to grow to Volkswagen size, would we? Various kinds of scientific equipment are used in the search for Urban Cryptids. Our most recent acquisition for use in the field is a brand new 60X power portable digital camera miniature microscope - more than powerful enough to study Skunk Ape hair samples and other "spoor" without having to return to the laboratory. The accompanying photo shows how it can zero in on the tiniest details. Even though the Missouri Department of Conservation has classified zombies as an invasive species we remain skeptical as to whether or not they actually exist. Whatever the case, it appears that some believers have actually planned a race through a supposedly zombie infested area, where each runner or bicyclist will risk being caught by the mutated walking dead! 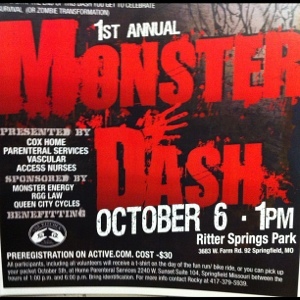 The Monster Dash will be held at Ritter Springs Park north of Springfield Missouri on October 6th at 1pm. You can preregister for the event on Active.com. We plan to be on hand to see if any actual zombies are prowling the area. 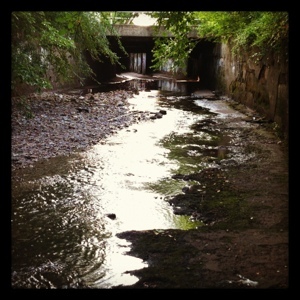 As we have continued to explore potential cryptid movement trails related to waterways through the city, we have noticed that many of these areas are also relatively poorly lit at night, making these pathways even more potentially attractive as corridors for nocturnal animal movement. One night, while following the north branch of the Jordan Creek drainage system, I spotted a particularly dark area within the residential neighborhood on the nearby plateau, not far from the well lit campus of Evangel University. This darkened area turned out to be the grounds of the National Guard Armory. 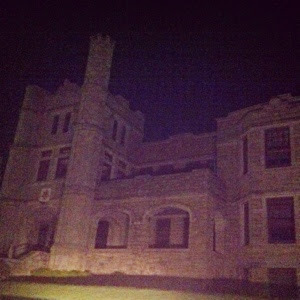 Following the darkened driveway into the Armory grounds, I came upon the pitch black silhouette of Pythian Castle. Back in 1913 the Pythian Castle was built by the Knights of Pythias to be an orphanage and retirement home. During the Second World War it was acquired by the military and at one time (supposedly) housed a few German prisoners of war. According to some, it is haunted to this day. Since our last entry describing the general location of the underground portion of Jordan Creek, we have been able to identify the full 0.65 mile course of the underground portion of the river, running through the center of Springfield Missouri, from the intersection of Washington and Phelps on the east end to the intersection of Main and Water at the west end - a buried channel approximately 30 feet in width and 9 feet in depth from channel floor to ceiling. Tests show the water quality to be surprisingly good, and we have begun our investigation of its animal life within the reparian zone. In spite of our current drought conditions we have been able to find plentiful examples, including darters and crayfish of the types normally associated with clear springs. We have also seen the remains of where some crayfish have been eaten, most likely by a raccoon. As seen in this photo, the stream continues its flow out of the underground tunnel exit beneath Main Avenue and continues straight west past these remarkable ruins, all within a long, deep open canal recessed over 8 feet into the earth (ground level is near the tops of the pictured monoliths). We are amazed that such a lush hidden world exists within an industrial area - proof that a creature such as the Urban Skunk Ape could easily exist and thrive among us without our ever noticing him! Most citizens of Springfield Missouri have visited Water Street, but few are aware of the reason for Water Street's name - an underground river flowing beneath their feet! Originally, Jordan Creek ran along the bottom of Booneville Hill, fed by a natural spring located near present day Founders Park. 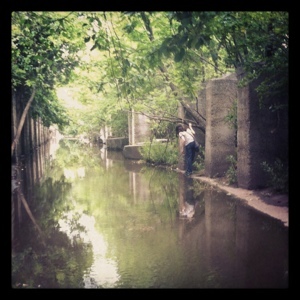 Nearby homes and businesses would sometimes be flooded by Jordan Creek during wet weather. To remedy this, the spring and creek were redirected into an east to west culvert and buried under arches and asphalt, creating an underground river running well over half of a mile under the center of the city. Even during our current drought conditions the spring and creek continue their steady flow. It is unclear if this river has any connection to the tunnels known to exist under the square, but we believe that the river tunnel is very likely being used at times by the Elusive Skunk Ape. In fact, it appears that the Skunk Ape is using much of the city's drainage system to travel unnoticed. 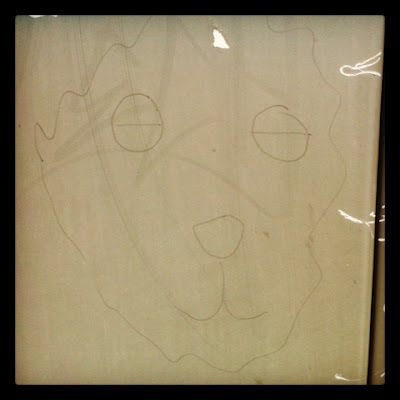 On March 23rd we described a mysterious cat image that had appeared at the southeast corner of Springfield's Discovery Center. Now, another creature has appeared only a few yards away. What could it be? 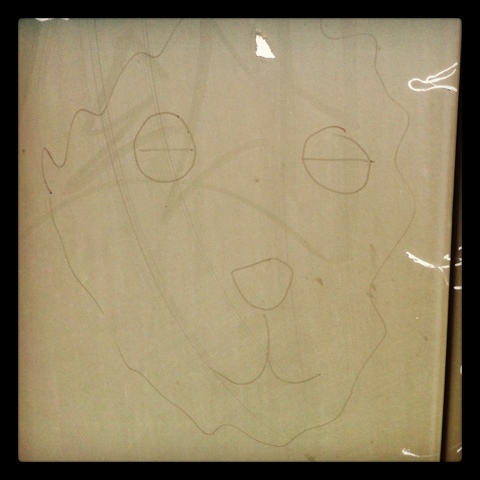 A tiger? A ferret? Perhaps something unknown to science? 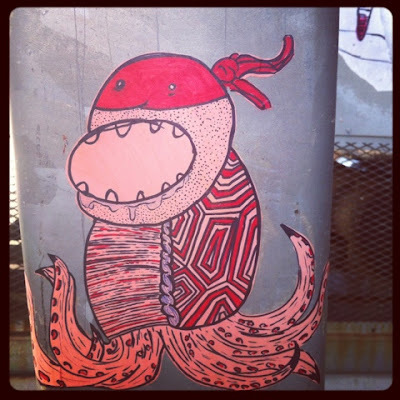 - found by E.C. As mentioned in a previous post, the world premiere of Believing in Monsters was staged at Willard High School in Willard Missouri this weekend. By all accounts the show was a rousing success. Strangely enough, though, outside the theater another monster was making an appearance. Willard High School has its own Green Monster feeding bin (like those described at other locations in previous investigations), and it hints that the infamous Green Monster may be undergoing unforeseen changes. 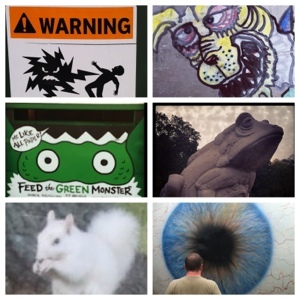 Unlike previous sightings of Green Monster images, this monster has developed a third eye! The Green Monster mystery grows stranger and stranger! BREAKING NEWS _ The Willard Community Theater presents the World Premiere of Believing in Monsters on June 22 and 23 at 7:30 P.M. at the Willard High School Theater. This is a show for all ages! Join us for a fantastical journey with dragons, mermaids, the boogey man, and the most horrific monster of all time. For the first time ever, the Willard Community Players will be flying! Don't miss the acrobatic feats, dancing on air, and the physical and artistic theatre that you have come to expect. Our box office phone number is 417-742-3524 ext. 3303. For the best seats, make reservations. Tickets should be available at the door. There will be a $5 minimum donation: all of the proceeds will benefit the Willard Children's Charitable Foundation. Don't miss this entertaining, enlightening, and educating experience! While exploring Founder's Park on Water Street (searching for more evidence of the Urban Skunk Ape) we caught sight of what appeared to be a strange two-headed monster beyond a group of buildings to the north. We circled the buildings onto Booneville Avenue and then followed the railroad tracks to the location of the beast. It proved to be a statue of some kind of two-headed creature secluded behind a chain-link fence. Making the situation even stranger, we recognized that it was the very same statue that had earlier been seen along the side of Highway 60 between Springfield and Republic, but had disappeared some time before. How did it arrive at its new location? 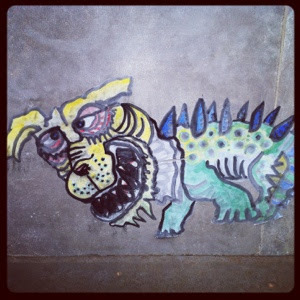 This strange image of some hideous creature was recently found along the eastern base of the Woodruff Building on Jefferson Avenue, What kind of creature does it represent, and how did it get there? Is there some connection between this image and the alien pictographs behind the Landers Theater? Until we know more, we're naming this creature "Woodruff". 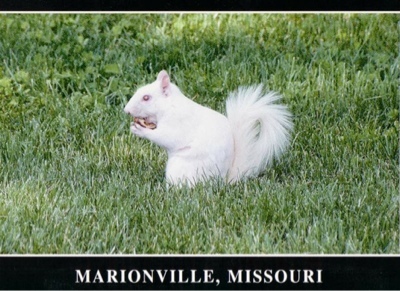 As runners from around the Ozarks prepare for next weekend's Running of the Squirrels 5K race in Marionville Missouri, we decided to take a closer look at that town's favorite mutants - the famous White Squirrels. Although commonly reported to be albinos, it is possible that these squirrels are actually carrying a gene for leucism, a similar condition causing white fur and dark eyes rather than the pink eyes found in albinism. Thus we set out to document the eye color of the White Squirrels. Arriving in town at approximately 8 AM we were quickly able to locate seven White Squirrels within a half acre space. Rather than behaving competitively (as squirrels often do) all seven appeared to be feeding peacefully and cooperatively. Although their eyes often appeared dark, it became obvious that most of the squirrels exhibited bright red or pink eyes. Within a few minutes we were able to capture 42 separate images of white squirrels via digital camera. Later, on inspection, we discovered something very unusual about our photographs. Each photo of a red-eyed subject was strangely blurred as if something was interfering with the operation of the camera. Only one photo was successful, the only photo taken when the subject's eyes were not gleaming red. Is it possible that the White Squirrel's glowing eyes had some mysterious effect on our camera? Perhaps these creatures are exhibiting mutations more powerful than previously thought! Where can you run a 5k race, raise money for a good cause, and be on the lookout for mutants, all at the same time? At the 7TH ANNUAL RUNNING OF THE SQUIRRELS 5K race in Marionville Missouri! That's because Marionville is infested with hundreds of mutant white squirrels! Yes, since the town was founded in 1854, it has been home to a population of squirrels carrying a mutant gene causing albinism. An estimated 250 white squirrels reside within the city limits, not counting gray squirrels that may be carriers of the mutant gene. If only we had these intrepid investigators on the case here in Springfield Missouri! 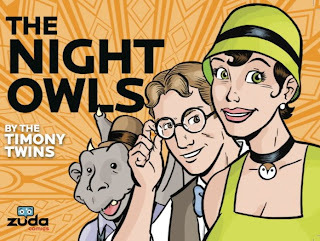 This fun online comic follows the adventures of the Night Owls Detective Agency - Professor Baxter, Mindy Markus, and Roscoe the Gargoyle - in New York City in the 1920's. Mystery and horror for the whole family! You may recall a previous post in which we reported on the Green Monster feeding bins currently found around town. 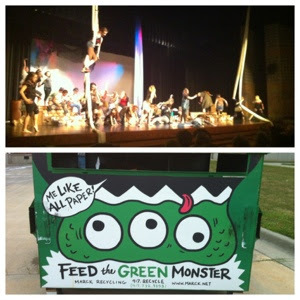 We had determined that paper was being collected from these receptacles and being transported by truck to some central location, perhaps the lair of the Green Monster itself! We now believe that we have found this central location - a mysterious facility surrounded by barbed wire, not far from Springfield, within the city of Republic, Missouri. What secrets lurk behind these walls? Is the barbed wire intended to protect us from the Green Monster, or to protect the Green Monster from us? You can count on the Urban Cryptid Rangers to find out! The presence of a creature like the Elusive Skunk Ape is often indicated by large footprints in the mud, but here we have an example that is especially strange. This truck was found in the parking lot of Murfin's Market in Willard Missouri. 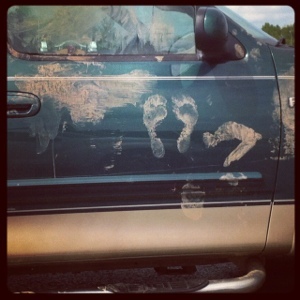 Smeared with mud, two large humanoid footprints can be plainly seen on the door. What kind of creature could defy gravity in order to leave such footprints? Found by S.C.
Omnivorous urban wildlife such as raccoons are known to raid garbage for food, but the Urban Skunk Ape is believed to be a herbivore and has not been known to eat garbage. What, then, could it possibly be eating? Fortunately for the Skunk Ape, Springfield has always been a community of backyard gardeners. 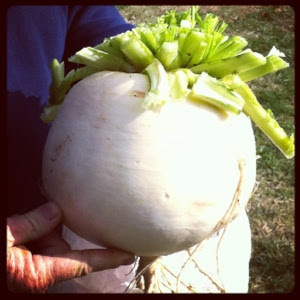 In this photo we see one proud local gardener showing off just one of his extra large turnips, each one big enough to feed a Slunk Ape for well over a day! Considering the fact that there are hundreds of gardeners in the city, it is no wonder that the Skunk Ape appears to be so plump. So next time you notice a tomato or zucchini missing from your garden, don't be alarmed - it's only the Skunk Ape dining from Springfield's largest buffet! 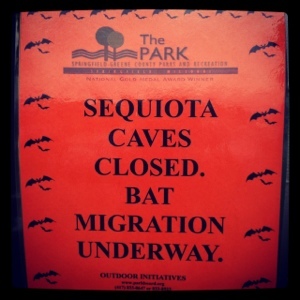 Attention Springfield Missouri cryptid hunters - if you have been thinking about exploring Sequiota Caves, please be aware that the caves are off limits at this time. Bat migration is under way, and these caves are a habitat for the endangered Gray Bat. Also remember that any caving equipment used at other times of the year should be disinfected to help stop the spread of White Nose Syndrome among our little furry flying friends. By the way, if you were planning on exploring these caves in hope of seeing the Elusive Skunk Ape, be aware that he stopped using them as a residence many years ago! 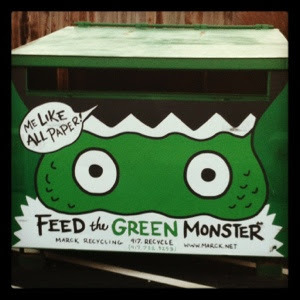 Throughout the city of Springfield, large bins such as the one pictured can be found, each one with the instructions to "feed the Green Monster". This begs an obvious question: Does each bin contain a small green monster, or are all the bins used to collect paper to feed one gigantic green monster? I was afraid to stick my head into the bin to find out, but after a diligent stakeout we discovered that these bins are regularly emptied and the contents are carried by truck to some central location. In the coming week we intend to follow one of these trucks to discover the location of the lair of the Green Monster. There are those who claim that some cryptids are the result of science gone awry - covert experiments and horrible accidents brought about by devious seekers of arcane knowledge - knowledge hitherto forbidden by Providence. So be warned as we relate the terrifying tale of the horror that recently befell the city of Springfield on March 17th, 2012. Amongst the many local dignitaries participating in Springfield's St. Patrick's Day parade this year was the celebrated ghoul and bon vivant Uncle Gregory, host of "The New Uncle Gregory Horror Hour". Although many in the crowd must have been well aware of his macabre style and tastes, one can only imagine the wave of terror that swept across the crowd when they saw that his tiny float was being drawn by... GIANT MUTANT IRISH POTATOES!!! Where did they come from? Where are they now? Was Uncle Gregory somehow responsible for the creation of these abominations? You will have to wait for a future episode of "The New Uncle Gregory Horror Hour" to find out... if you dare! Skunk Ape hot dog theft? Although cryptids of his type are commonly considered to be omnivorous, current evidence suggests that Springfield's own Skunk Ape is a vegetarian. That assessment was called into question last Friday evening when a nice lady working behind the counter at Emack & Bolio's, a local ice cream parlor near the Skunk Ape's known lair, reported that they had mysteriously run out of their delicious "Nathan's Famous" hot dogs. Had they been stolen by the Skunk Ape? If so, this would be the first example of meat in the Skunk Ape's diet, and it would be the first time that the Skunk Ape had stolen anything of value. On further examination, this proved not to be the case - It turns out that they had simply sold their entire supply that day. 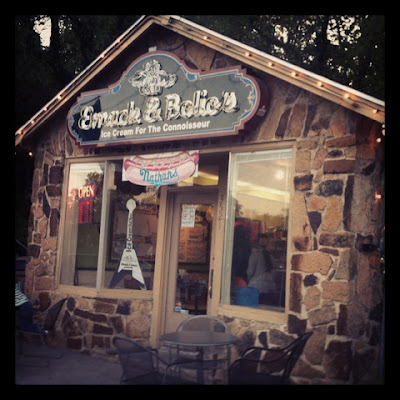 We encourage everyone to stop by Emack & Bolio's and enjoy a hot dog and ice cream when visiting Sequiota Park. While taking a stroll down the Galloway Trail we were able to capture this odd sight. 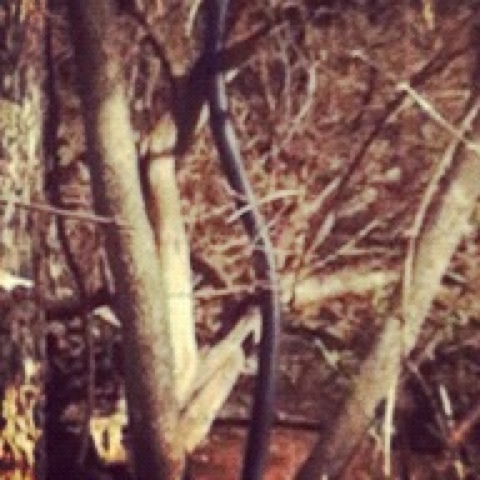 At about 40 yards from the trail we saw what appeared to be a huge black segmented worm crawling up one of the trees. Unfortunately, this was not a new cryptid. On closer inspection it proved to be a large length of corrugated drainage pipe hanging from a tree. Still, a mystery remains: how did it get there? Again, we are ready to blame the elusive Skunk Ape, a creature whose presence in this region has been well-documented! - found by S.C. 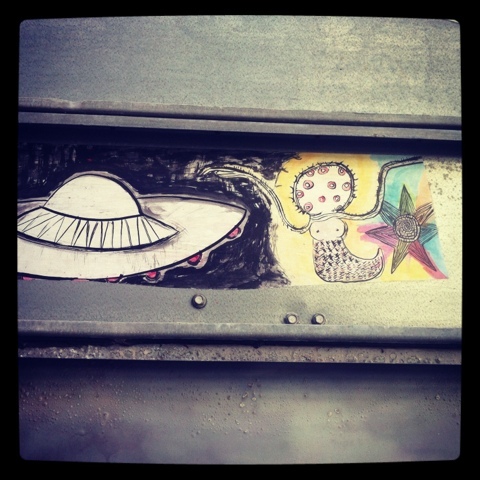 Here's intriguing evidence that aliens from other worlds have visited the alley behind the Landers Theater in Springfield! 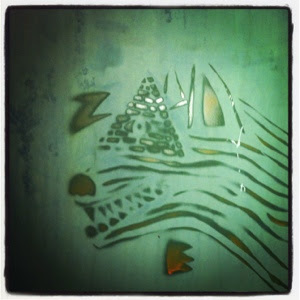 These pictographs were found on metal objects in the alley. Is the 'Landers' a 'Landing Pad'? 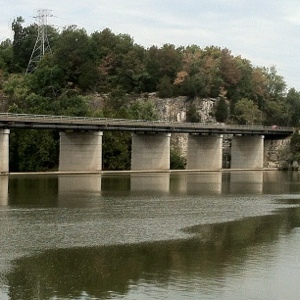 - found by S.C.
Springfield Missouri's largest source of drinking water is Fellows lake. The photograph below represents, what we believe to be, the first appearance of the Fellows Lake Monster. Of course, it might be just an old tire floating in the lake. Please don't throw trash in the lake. The people of Springfield and the Fellows Lake Monster will be better off if you don't! - found by E.C.